Welcome to PNP Games, your source for everything video games! 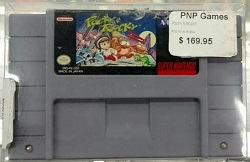 PNP Games is a locally owned and operated video game store based out of Winnipeg, Manitoba, Canada, which started as a home-based business in 2005 selling on eBay. We opened our first retail store in Winnipeg, located at 915 McLeod Ave, on September 17th, 2007 and have since opened two additional locations, at 2609 Portage Ave and 160 Meadowood Drive. At PNP Games we are committed to providing the highest quality, and largest selection of games, at reasonable prices. We specialize in the classic systems such as the original Nintendo, Super Nintendo, Nintendo 64, PlayStation, Genesis, Atari and many more. We also carry all of the new systems, games and accessories as well. If you’ve got scratched or damaged discs that won’t play in your system, we also perform a variety of video game cleaning and repair services. We can now repair all disc based games, movies, CDs, DVDs and software depending on the severity of the scratches/damage. With the exception of Blu-Ray discs, we can repair anything that is the same size as a regular CD, or Gamecube disc.